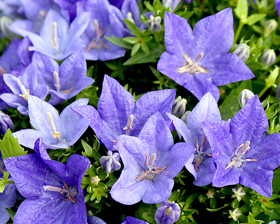 This balloon flower or campanula cultivar is a dwarf selection that typically grows to only 40cm tall. Features unique, puffy flower buds shaped like hot air balloons which open into 8cm diameter, single, blue, upward-facing, bell-shaped flowers with five pointed lobes. Oval, dentate leaves to 7cm long. Blooms most of the summer. Sow from February to June on the surface of a good seed compost just covering the seed with a thin layer of compost or vermiculite. Germination takes 14-30 days at 18-20C.